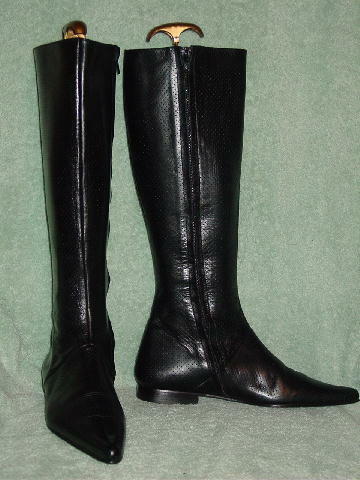 These vintage elongated pointed toe black leather boots have a perorated mini hole pattern on the entire surface. 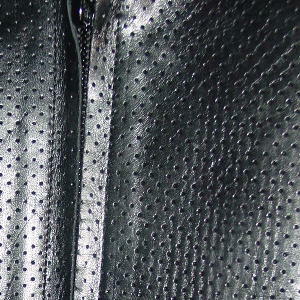 There is a 16" long zipper on the inner sides. The linings are red leather. The stamp in the lining says UK 4 EUR 37 & US 5 1/2. But the boot was worn by a model who took a size 7 shoe. They're from a stylist's inventory, and were worn in a magazine photo shoot. top center edge to bottom of heel 16 3/8"